This fabulous side dish is a perfect accompaniment to your Sunday roast. 1. Preheat the oven to 200°C/fan180°C/gas 6. In a saucepan, bring 200ml vegetable stock to the boil with 2 garlic cloves, lightly crushed, then remove from the heat and stir in 200ml double cream. Set aside to cool and infuse. 2. Heat 1 tbsp olive oil in a pan and gently fry 1 large onion, chopped, for 10 minutes, until very soft. 3 medium potatoes, sliced to 3mm thickness, and toss with 1 tbsp plain flour, 1 tbsp chopped fresh flatleaf parsley and some seasoning. 4. 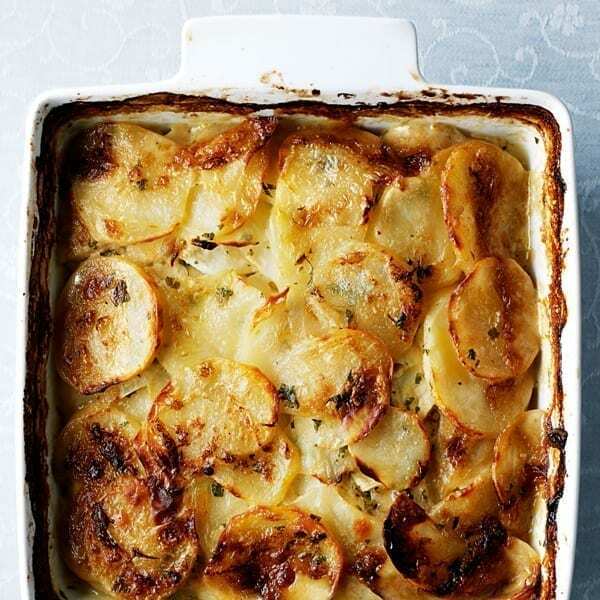 Butter a 1.2-litre ovenproof dish and layer up the celeriac, potatoes and the softened onion. Strain the cream mixture (discard the garlic) into a jug and pour over the gratin. 5. Bake for 1-1¼ hours, until golden brown and bubbling and the potatoes are cooked through.